A huge bonus of being married to Josh? He LOVES breakfast, but even better…he loves making breakfast. What’s better than that, you ask? It’s that I’m always the lucky recipient of his talents. It’s a tough, tough life. This past weekend, Josh tried a new recipe. If I have my way, I’ll be eating these every Sunday morning from here on out! Jack Johnson has it right, waking up slow with Banana Pancakes is probably the best thing ever. 1. Combine flour, sugar, baking powder & salt. 2. In a separate bowl, mix together egg, milk, oil and mashed bananas. 3. Grease a griddle or large frying pan and heat to medium heat (we have this flat Calphalon griddle and LOVE it and use it almost every day). 4. Pour batter in 1/4 cup scoops onto pan and cook until golden brown. Serve warm with syrup, banana slices, walnuts, etc. Seriously, my husband is such a blessing to me and I do not take him making breakfast for me every weekend for granted! He is so good to me and I am so thankful for him! 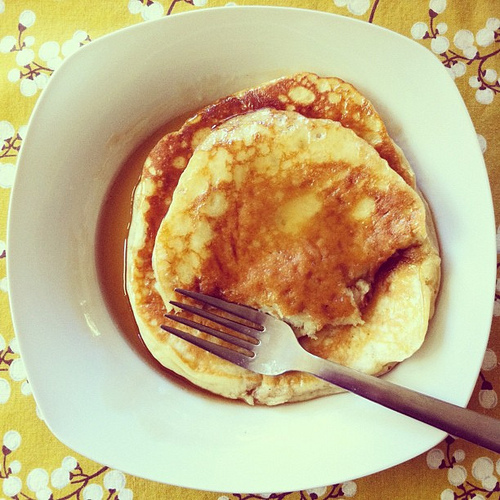 Hope you get to enjoy these yummy pancakes with someone you love! I bet my boyfriend would love these! you mix the contents of step 1 and 2 together before cooking, right? Yes- mix step 1 & 2 before cooking. Looks like I missed that step! Gotta fix that :) Enjoy!